Kremenets Mountains [Кременецькі гори; Kremenets’ki hory]. (Map: Kremenets Mountains.) 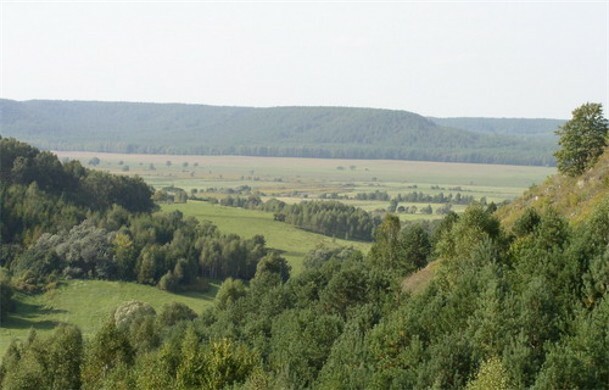 Chain of low mountains in the northern part of the Podolian Upland in the vicinity of Kremenets in Ternopil oblast. 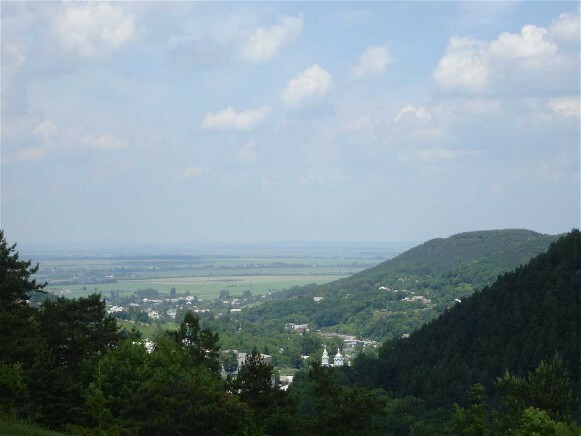 The Kremenets Mountains extend approximately 20 km between the valleys of the Ikva River and the Viliia River. They rise to 300–400 m above sea level (the highest peak reaches 408 m), or 150–200 m in relative height. The mountains are highly eroded, built mostly of chalk, clay, sand, and limestone. They include low mountain chains, outliers, and flat plateaus separated by river valleys, ravines, and gullies. In the north, they descend in a steep incline to the plains of Little Polisia. They are located in the northern region of the forest-steppe and are covered partly with oak, elm, and pine forests and partly with steppe vegetation. Agriculture is well developed in the area. The mountains are especially famous for their picturesque landscapes.